Weddings at Blue Gum Country Estate are tailor-made to suit the individual couple, with gourmet food, passionate service and warm hospitality ensuring that this special day will always be a cherished memory. You will find Blue Gum Country Estate near Stanford, a small town, in an unexplored valley, just beyond Hermanus and within two hours drive from Cape Town. The delightful estate is nestled among ancient Blue Gum trees, overlooking the leafy banks of the Klein Rivier and encourages guests to relax in tranquil beauty and comfort. Blue Gum is a working wine farm and developing vineyard and is the perfect wedding venue for those seeking a place for romance, rejuvenation and to celebrate in endless luxury. A number of exquisite ceremony spots are offered on the property and the reception space can be laid out according to the wedding couple’s specifications. Spacious luxury accommodation for up to 28 guests is available on the estate, and is within short walking distance of the venue and facilities. If the wedding party requires extra accommodation there are a number of excellent options within 5kms. Each wedding will receive the dedicated attention of the Blue Gum Team. We are delighted to assist on the momentous day of two people starting their lives together. 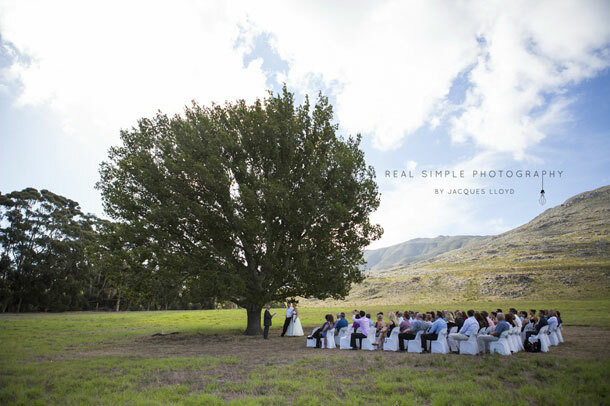 To book this gorgeous venue visit Blue Gum Country Estate.